Heat grill. In blender container or small bowl, combine all herb rub ingredients; blend until well mixed or crush and mix herbs with back of spoon. Rub oil evenly over steak. Sprinkle steak with salt and pepper; rub steak evenly with herb mixture. When ready to grill, place steak on gas grill over medium heat or on charcoal grill 4 to 6 inches from medium coals. Cook 12 to 16 minutes or until steak is of desired doneness, turning once. To serve, cut into thin slices. * Crush fennel seed with a mortar and pestle, or by placing seeds on cutting board and rubbing with flat side of chef's knife until crushed. 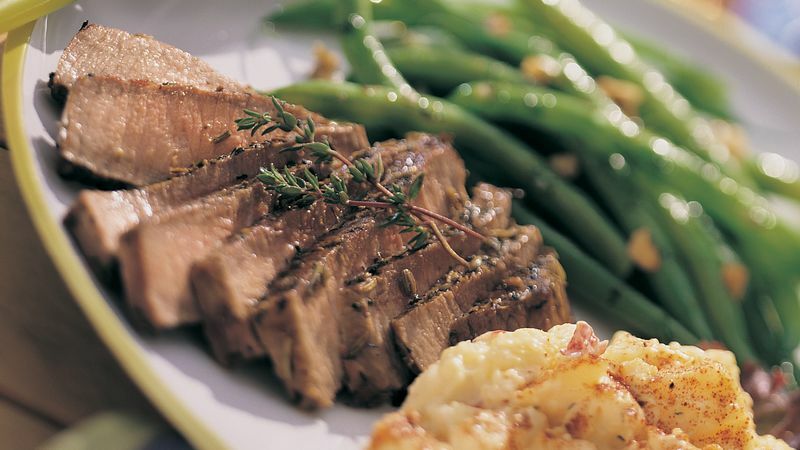 To broil steak, place on broiler pan; broil 4 to 6 inches from heat using times above as a guide.